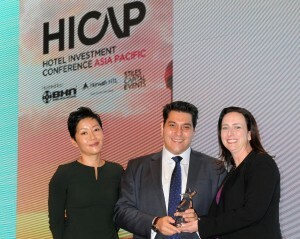 Hong Kong, 16 October 2015: In partnership with the Hotel Investment Conference Asia Pacific (HICAP), the International Society of Hospitality Consultants (ISHC) presented Nihat Ercan with this year’s 2015 Rising Star Award Asia Pacific. During his 13 years with JLL, Ercan has conducted over USD4.5 billion in hospitality transactions including a number of landmark deals like the Grand Park Orchard Road Singapore and the InterContinental Hong Kong – two of the largest single hotel transactions ever recorded in Asia. “Nihat has established himself as one of the most respected advisors and brokers in the industry. He acts as a leader by setting high standards and behaving consistently with the cultural requirements this demands. Through his own actions, he promotes open, constructive and collaborative relationships with peers, his team and clients. He is extremely committed to the growth of the hospitality sector and has the ability and skill set to be one of the industry’s future leaders,” said Aaron Desange, Senior Vice President, Investment Sales Asia, JLL Hotels & Hospitality Group. ISHC launched the Rising Star Award Asia Pacific last year in partnership with HICAP to recognize young, emerging leaders in the Asia Pacific hospitality community. Nomination criteria requires an individual be 35 years and under, be currently working and living in the Asia Pacific region and have a minimum of two of the most recent five years’ experience living in the Asia Pacific region and working in the hospitality development and/or investment field. Ercan, currently Executive Vice President of Investment Sales Asia Hotels & Hospitality Group for JLL, was nominated among many young, dynamic leaders in the Asia Pacific region, a key indication of the hospitality industry’s potential in this region despite the slowing of Asia’s economy. HICAP is Asia’s largest and longest running hotel investment event, making it the most important gathering of hotel developers, investors, lenders, operators, and other industry executives for information exchange, trend spotting, and deal making. The 26th annual HICAP held in October 2015 in Hong Kong attracted approximately 800 delegates from around the world. BHN is the worldwide leader in developing and organizing conferences for the hotel and tourism investment community. With almost three decades of experience, nearly 130 events completed to-date, and almost 90,000 international delegates, BHN conferences have become “must attend” events for industry leaders who come together to network, conduct business and to learn about the latest trends. BHN events include: the Americas Lodging Investment Summit (ALIS) in Los Angeles; ALIS Law in Los Angeles; ALIS Summer Update; Alternative Ownership Conference Asia Pacific (AOCAP) in Singapore; Caribbean Hotel & Resort Investment Summit (CHRIS) in Miami; Hotel Investment Conference Asia Pacific (HICAP) in Hong Kong; HICAP UPDATE in Singapore; Hotel Investment Forum India (HIFI) in India; Hotel Opportunities Latin America (HOLA) conference in Miami; and Hotel Investment Conference Europe (Hot.E) in London. Horwath HTL is the world’s largest hotel industry specialized consulting organization, currently with 42 offices in 37 countries. Since the set-up of Asia Pacific operations in 1987, Horwath HTL – Asia Pacific has been involved with thousands of projects throughout the region in all phases of the property lifecycle for clients ranging from individually owned businesses to the world’s most prominent hotel companies, developers, lenders, investors, and industrial corporations. Horwath HTL currently operates out of regional offices in Tokyo, Beijing, Shanghai, Hong Kong, Bangkok (Health & Wellness), Singapore, Jakarta, Kuala Lumpur, Mumbai, Sydney, and Auckland.